Young Fallon also developed a knack for impressions (James Cagney was an early one) and began a well-documented obsession with Saturday Night Live (later, when he went off to college, he’d forego Saturday night ragers in favor of staying in and watching SNL by himself). 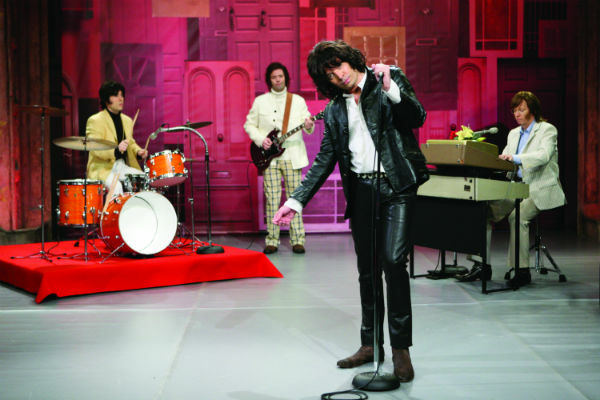 Fallon remembers being drawn to the musical impersonations on the show, citing in particular a 1993 “Rock For Michael” benefit sketch, in which everyone from James Taylor (Kevin Nealon) to Eddie Vedder (Adam Sandler) takes to song in an attempt to change Michael Jordan’s mind about retiring. By 1998, Fallon himself would be performing musical-comedy numbers on Saturday Night Live. After years of low-paying stand-up gigs and a stint studying at the famed Groundlings Theater in Los Angeles, he landed his dream gig by making SNL producer Lorne Michaels laugh – no mean feat – with his eerie-accurate Adam Sandler impression. Possessing nonthreatening good looks and mischievous-boy charm, Fallon became a break-out star just four shows in, when he performed “Halloween carols” in the style of Counting Crows, Matchbox 20, Alanis Morrisette and Marcy Playground on Weekend Update. (Ah, the nineties!) He’d do a total of six seasons of SNL, including four spent co-anchoring Weekend Update with Tina Fey, before leaving the show to pursue a movie career – a rare professional misstep, as anyone who saw him star opposite Queen Latifah in the 2004 bomb Taxi can attest. “Oh, it’s great,” Young said in a recent cover story in this magazine, when asked about Fallon’s impersonation of the younger him. “I’d like to see him do me now.” Informed of Young’s take on his impression, Fallon replies, “The challenge is on! Yeah, I’d love to do him now. I’m a giant fan, too. Most of the people I do impressions of, I’m big fans of.” Fallon also holds out hope that the real Neil Young and his ’70s counterpart will one day perform together on Late Night. But really, he would much rather be Jimmy Fallon, late-night television talk-show host and comedic chameleon. “For a second, you pretend that you are Bowie – for just a second, then you come back to reality,” Fallon says. “It’s almost better in a way. I don’t have to go out on tour for two years and not see my wife. I can be Bowie tonight, I can be Neil Young tomorrow, I can be Bob Dylan next Wednesday, and I can rap with Justin Timberlake on Thursday. And I don’t have to leave New York.” Besides, who needs Wembley Stadium when you can headline the Wolf Room any night of the week?